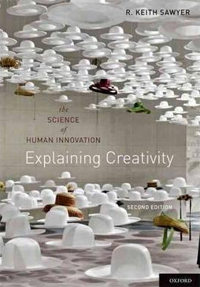 In Explaining Creativity, author and professor R. Keith Sawyer gives a comprehensive overview of the psychological research done on creativity so far. 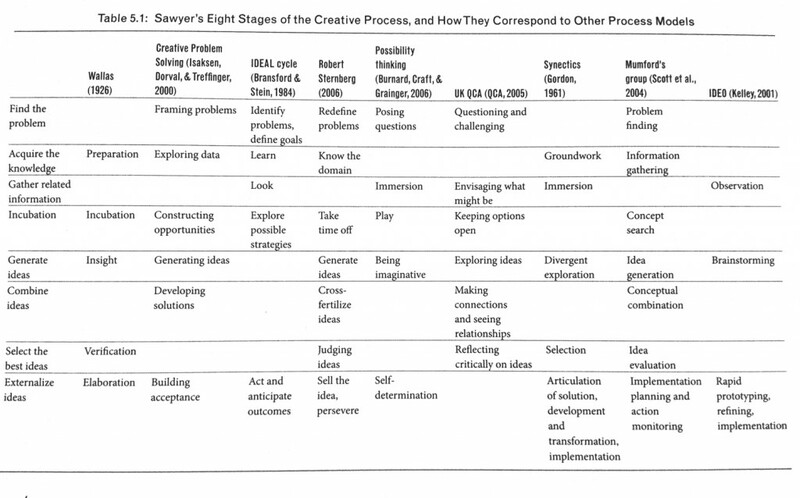 Though he touches topics such as the history of creativity research to research on creativity in various domains such as art and science, one of the most valuable parts of Sawyer’s book is his detailed discussion of the stages of the creative process. Although he divides his discussion up into eight stages, he does draw connections between the stages in his process to other models of creativity such as the classic model of creativity from Wallas (1926). Finding and formulating the problem. Acquiring knowledge relevant to the problem. Gathering potentially related information, being alert to opportunities to apply unrelated information to the problem. Taking time off for incubation. Generating a large variety of ideas. Combining ideas in unexpected ways. Select the best ideas, applying criteria relevant to the problem. Externalize the idea using materials and representations. Sawyer stresses that these stages may or may not happen linearly, and that it’s likely a process that repeats over and over throughout the lifetime of a project. For example, it’s likely that a project will consist of various mini-insights rather than one large insight, and it is the sum of those mini-insights that result in creative work. Steps 2 and 3 may sound rather similar, but Sawyer draws a slight distinction between acquiring and mastering domain knowledge (e.g. studying medicine, law, design) versus acquiring potentially related information that may or may not be domain-specific (e.g. taking inspiration from burrs of the burdock plant to invent Velcro). The former requires dedication and many years of study / practice, whereas the latter requires being open and absorbing information from your environment. In addition, Sawyer also describes experimental evidence for the “incubation effect”: where study participants who had to solve a problem were more likely to get the right answer if they were allowed to do something else completely different during break time rather than working on a similar problem. The reasoning behind the incubation effect may be simply rest—one is reinvigorated to work on the problem again, or it’s allowing the wrong dead-end solutions to be selectively forgotten, so that other potential solutions that were initially suppressed have a chance to be considered. Though these points merely scratch at the surface of Sawyer’s overview of the literature for each of these stages, perhaps the most relevant aspect of this book for my thesis would be his description of the eight stages of the creative process. His integrated framework of the creative process combines and takes into account concepts from various other models of the creative process, therefore it seems like a good model to start drawing comparisons with and to make connections from the other readings (that may not make explicit reference to any creative process, such as Markman’s Smart Thinking) back to the creative process. Doing this should be helpful in aligning my readings with the analysis of my user research data, so that I can identify potential roadblocks in the process that people may be running into. [Update:] Actually I’ve started doing this already, and it’s proving helpful. Click for larger view. Use Sawyer’s model of the creative process as a framework to compare, contrast and find relationships between the readings as well as user research data, so that further design implications (which may involve disrupting the whole process altogether!) can be drawn out. Welcome to my thesis blog! I'm Priscilla, and I'm writing this thesis for my Masters degree in Interaction Design, but more importantly, to satisfy this curiosity I've had for a few years now to learn about how creativity really works, and of course, to design something that can support people being creative. This project should last one year, from Spring 2012 - Spring 2013. Feel free to contact me if you have any comments / feedback at priscilm [at symbol] andrew.cmu.edu. Copyright © 2019 real-world creativity.